CiviCRM keeps an eye on the various changes that you make to contacts, memberships and so on. 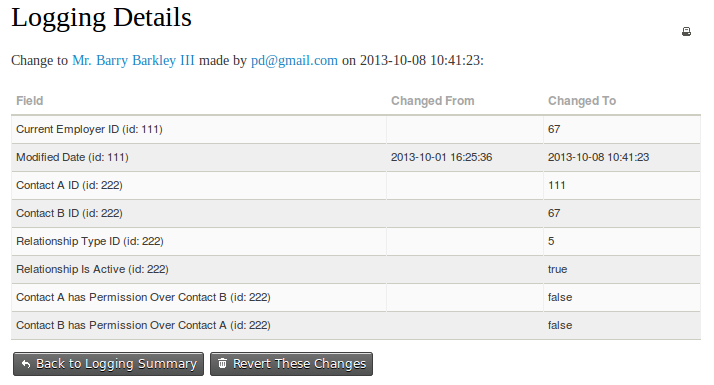 Each contact has a change log tab which is populated each time a contact is added or edited. The change log shows who changed the record and when the change was made. This light-weight logging is turned on by default and many users find it detailed enough. One key missing piece, however, is information about what was changed. Detailed logging adds information on what has changed and provides many other features. When you turn on detailed logging, the screen will look something like the below. Clicking on update on the left hand side will show details of the change. This logging extends to almost all data that exists in CiviCRM, including your contact, membership, event, etc., and also all of the 'meta data' in your install, such as Activity Types, Case types, Contribution Types, etc. With detailed logging turned on, any changes made to your data can be reverted, which means you can worry less about unwanted changes to the data, and whether they are done by administrative staff or by contacts interacting via your website - either maliciously or accidentally. As you can imagine, logging all changes to the database can result in the collection of quite a lot of data and will have a small performance impact on your database. For this reason, we turn of logging by default in CiviCRM and let people turn it on if they require it. Before you decide whether you want to turn on logging, you might want to have a look at other ways in which time based logging happens in CiviCRM. 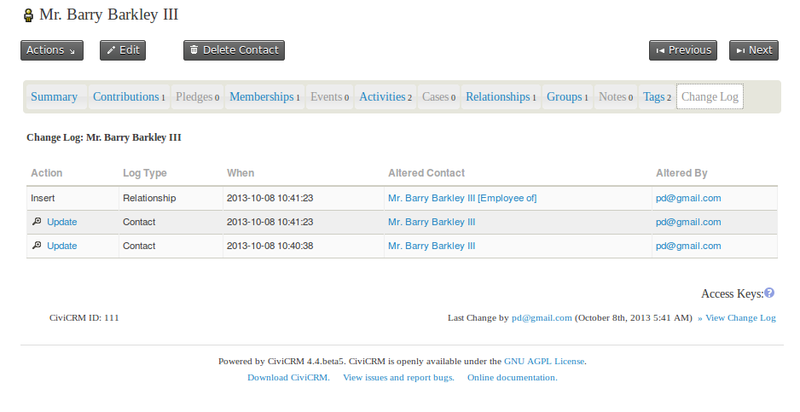 The use of activities to record data in CiviCRM is often useful as an alternative to logging. Since each activity happens at a specific point in time, you can view the activity tab on a contact record as a log of changes to that contact over time. 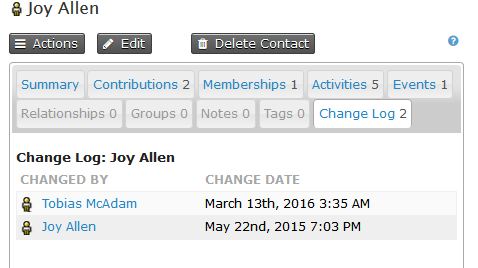 This isn't to suggest that each time you make a change to a contact in CiviCRM you should record an activity. Rather that, in some use cases, the data collected in the activity log provides a good enough log of changes to contacts over time, and supplementing that with a couple of manually recorded activities may cater adequately enough for your logging needs. In a similar way to activities, over time a membership will grow into a historical record of the membership, with a record of any contributions that went toward that membership and any renewals, up-sells, etc. It might be that this out-of-the-box logging meets your needs and means that you don't need to turn on detailed logging. One of the great benefits of turning on detailed logging is the ability to revert any changes that you make to you data. For a lot of contact fields we make this easy by creating a revert button at the bottom of the screen that shows details of the change. This screen isn't available for all contact changes, however, data is still being recorded behind the scenes. If you do need to revert data that cannot be reverted via the user interface, you should contact your system administrator or get help from someone that is familiar with CiviCRM's detailed logging functionality.